Area X-8 is the eighth course of Secret Storage and the one hundred first course overall in Mario vs. Donkey Kong: Mini-Land Mayhem!. 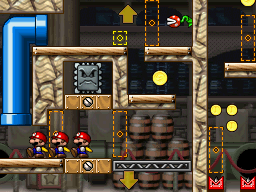 The Mini Marios begin at the bottom center, with the exit door at the bottom right. In order to reach it, they must simply be guided via a series of Long Springs and Blockers to it while avoiding Piranha Plants, a Snifit, and a Thwomp. The M-Token is located near the top right, near the Piranha Plants. To collect it, the Mini Marios must enter the top left Warp Pipe, then fall from a deactivated Blocker to it. The Mini Mario Card is located near the middle left, near a Warp Pipe. The Mini Marios must bounce from the nearby Long Spring into the Warp Pipe, then make their way left to fall down to a Blocker to reach it. In Plus Mode, the Mini Toad must be guided to the exit door first, followed by the two Mini Peaches.